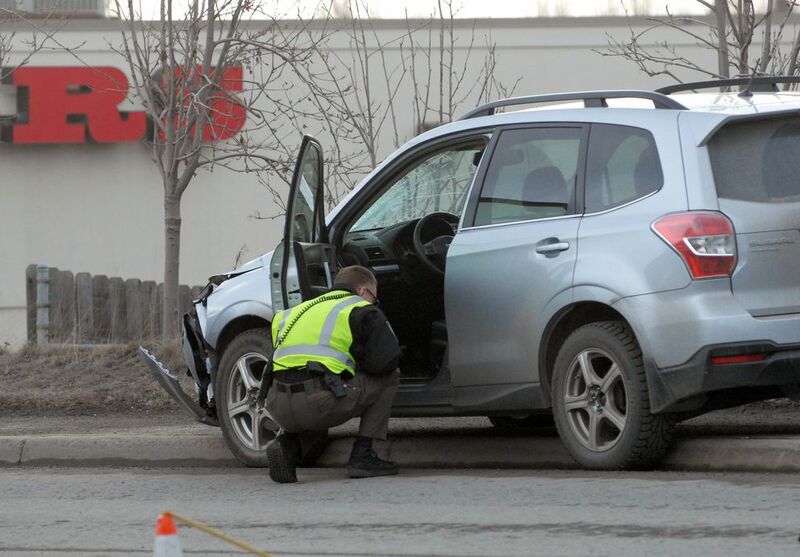 A 60-year-old Anchorage nurse had more than twice the legal limit of alcohol in her system when she slammed her Subaru into two siblings riding their bikes on the sidewalk in downtown Eagle River on Sunday afternoon, according to newly released court documents. Vicie Zielinski is charged with two counts of felony assault, as well as driving under the influence for the incident, which left the children with broken bones and facial injuries. Zielinski appeared in court Monday, at times crying as a magistrate judge asked her questions and set bail for her. A charging document in the case detailed for the first time what police say happened: Just before 4 p.m., Zielinski was driving her Subaru Forester in downtown Eagle River when she drove onto the sidewalk on the west side of the road, hitting head-on a brother and sister riding bikes. The area where the children were hit is a busy stretch of the Old Glenn Highway between Coronado Street and Park Place Street, near the Boys & Girls Club and a string of fast-food restaurants and coffee shops. The boy broke several bones in his right leg and suffered “significant facial trauma,” according to the charging document. His sister sustained a head injury and a fracture to her orbital socket, along with a bruised lung, the charging document said. Their ages have not been released. Both were taken to Providence Alaska Medical Center — the same hospital where Zielinski is employed as a nurse, according to hospital officials. Zielinski stayed at the scene, according to the charging document. Officers noted slurred speech and bloodshot eyes. She failed every sobriety test given to her, prosecutors said. Her blood alcohol content was .189, more than twice the legal limit. Records show Zielinski lives less than a mile from the site of the collision. She has no previous criminal history in Alaska, according to court documents. As of Monday, Zielinski remained an employee of Providence, said hospital spokesman Mikal Canfield. He did not say which department she works in. State records show that Zielinski also faced a sanction on her nursing license in 2016 for failing to complete required continuing education classes. At her arraignment Monday, a magistrate judge set a $10,000 bail for Zielinski. She isn’t allowed to drive, leave the state or consume alcohol.